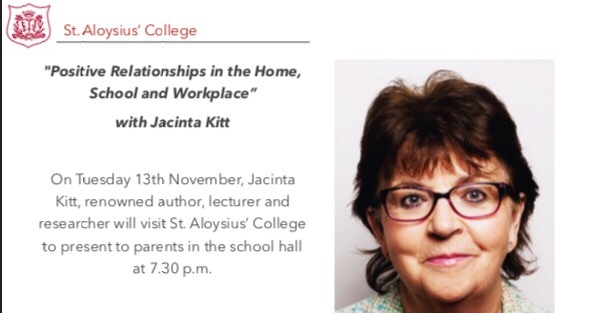 St. Aloysius’ College parents should not miss the opportunity to see Jacinta Kitt present on positive relationships in the home, school & workplace next Tuesday November 13th 2018 at 7.30pm in the College. Ms. Kitt, through her vast personal & professional experiences, weaves a rich tapestry of support & advice for her audiences which is as entertaining as it is educational & enriching. We are thrilled that Ms. Kitt will be working with our 6th year students, our whole staff & the parent community in support of our whole-school wellbeing programme.